Please join us in worship and fellowship ~ all are welcome! St. John’s Episcopal Church is a vibrant, welcoming and diverse community of faith located in the heart of the Litchfield Hills that is actively engaged in a mission of outreach to its immediate community and the wider world. Our call is to a mature living Christianity where Scripture, Reason, the Sacraments and apostolic Tradition offer us a glimpse of the Holy and enrich our spiritual and devotional lives. We are progressive in our understanding of the Church’s mission to bring Christ to all people, orthodox in our theology, traditional in our liturgy and catholic in our devotional practices. Founded in 1794, St. John’s Church was originally built in Davies Hollow by the families of the newly created town of Washington, CT. It was moved to its current location on Green Hill Road in 1917 as the congregation was growing and it needed a larger space to hold services as well as community activities. Ehrick Rossiter was asked to be the architect and he designed the new church in an English medieval style. 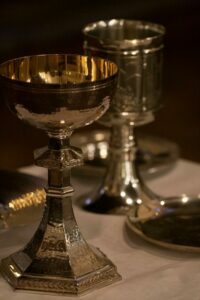 In its worship life St. John’s seeks to give expression and meaning to its belief in the Anglican notion that Scripture, Reason, the Sacraments and apostolic Tradition offer us a glimpse of the Holy and enrich our spiritual and devotional lives. May 18th at 6PM – PARISH POT LUCK Plans are in full swing - mark your calendars. For the POT LUCK, St. John's will provide the entree. Please join us by bringing a side, salad, or dessert and a friend to share it with. Our 2019 pledge campaign is ongoing - if you need a pledge card, please contact the Church.